The Credit Card Lesson of the Day: Keep your receipts! | Save. Spend. Splurge. Home › Money › Budgeting › The Credit Card Lesson of the Day: Keep your receipts! The Credit Card Lesson of the Day: Keep your receipts! Buy something for $5 on my credit card. Log it into my budgeting tool to track my expenses. Log online and pay the $5 immediately towards the credit card. I have been doing this since I got my first credit card at 16, and I have never paid a red cent in interest, nor have I ever forgotten to do so before being charged for my mistake. I think I already paid the amount, so I don’t pay it — happened for the first time today! So what happened is we were shopping at the same store, but I was buying something for the common budget (our household budget), and something for myself. I took two receipts so I could enter them separately and not deal with the hassle of calculating taxes. When I got home, I logged in what I thought were all the expenses, but I totally forgot that I had two receipts from the same store. I had only logged one amount, but not the other. When I combed through my credit card statement today (as I always do, once a month), I copied all the transactions into Excel, went through and deleted all the cells of the matching debits and credits (a.k.a. charges and payments). It kind of looks like this when I go through in Excel. Each matching cell has a store charge, and a payment to coincide with it. If I am off by even ONE PENNY, I can tell. It also makes it easier to find out where I went wrong, if I don’t see a matching payment. I was left with almost empty cells, except for that one transaction (not pictured above), I forgot to enter because it was two receipts from the same store. Without my tracking system and credit card paying method, I never would have caught my error. I was dumping out all my receipts onto the floor, searching for all the ones from that store, and I was about to call CIBC and scream “FRAUD! FRAUD!!! !” with a pitchfork in my hands, and fire in my eyes, but thankfully, I came out of it without any egg on my face. Frankly, it’d be easier to pay everything in cash or with a debit card, but credit cards give me back 1% in either cash or grocery points, and … well, 1% is 1%, considering how much I spend per year for myself and my business. How do you deal with credit card payments? That is, if you use them? I keep all my receipts in an envelope labeled with columns for itemizing; groceries, eat out, gas, pet, gifts, household, personal care, & extras. Extras would be clothes, liqueur, trips, etc. Each month has an envelope, and I total all my columns each month and then I really look at them. Once I’ve done that, I file them. If I ever need a receipt to refer to, or return something, I know right where to find it based on what’s written on the envelopes. I check my cc statement online about once a week, or so, just to make sure it’s legit, and I pay my balance in full about a week before it’s due. I’ve only forgotten to pay my card on time once so far. I think I like the idea someone had to sign up for an auto pay for the card I use all the time, should I ever forget to make a payment on time again. I use one main card for mostly everything to get flight miles, and a couple other cards so I can get free shipping/returns, and bonus points from certain retailers ordering online. Otherwise, I’m a cash paying freak for many of my daily (groceries, gas, eating out, hair cuts, etc) expenses. When I’m out of my set amount of cash, or running close, I quit buying stuff. This is how I rarely go over my monthly budget. If I’ve charged something big (trip, expensive clothing or gift, car repair, etc) I don’t put anything else on my cc until it’s paid off. It’s a rule I have. I will allow 2 or 3 months to pay off a purchase if I’ve deemed it worth it, but I just know there will be no more purchases on that card until it’s paid off in full. How I roll, and for the past 10 years, so far so good! I have a pretty similar process – I don’t always pay it the next or same day – but within a week I do. I usually wait for the charge to be posted on my credit card so I can verify the charges before paying it. I do that too but only out of sheer laziness. I usually go through all of them when I see my wallet about to burst.. then I mass pay each transaction one by one! I don’t do anything very different from you, except I pay my cc bill once a month. All my receipts are kept until I enter them into my budgeting Excel spreadsheet, usually every evening. It takes longer for the spreadsheet to open than for me to enter things in usually. Most weekdays I don’t even have expenses, so it’s pretty easy. 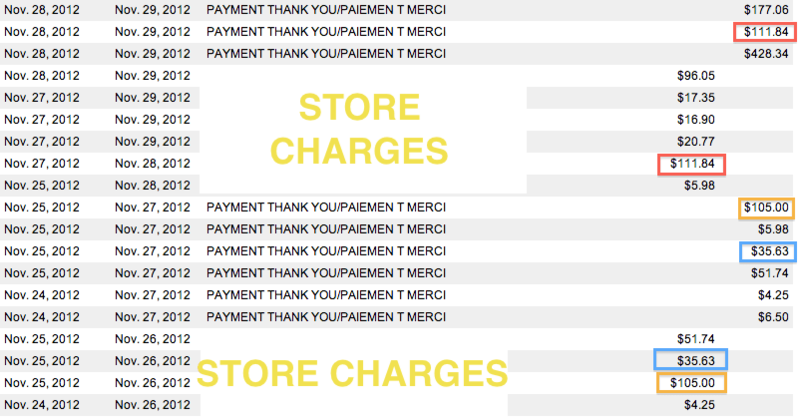 Plus, my brain auto-records each purchase/place/time automatically now in a sort of snapshot–so even when receipts aren’t available my brain keeps the amount and what I spent it on, safe. In the spreadsheet, I record the amounts, the budget category they fall under (“eating out”, “groceries,” etc. ), usually a short description (“italian after PhD defense with Tracy July 1”) which also sort of acts like my diary. If need be, I also assign the expense a further category to track, say, my alcohol or transportation spending. At the end of the month, when my cc statements come through, I go through each cc statement and match up the charges. I have my cc’s all set to auto-pay in case I forget one month. Neat to get a look into what other people do!! Wow. You can remember each amount? Impressive. I just make a note in my AwesomeNotes on my iPod Touch or in Reminders…. Interesting system. I keep track of my spending on Mint and make notes about what expenses are for there. I also keep an eye on my credit cards online, just to make sure nothing fraudulent is happening. Then at the end of the month, I pay the statement balance in full. I’m too scared of Mint. I don’t like giving them access to my personal banking information and the government of Canada doesn’t recommend those sites either.. better safe than sorry. I normally pay the credit card in full once a month, because I have a 45 days interest free period. I also log everything I’ve been spending every day and at the end of the month check the values with the credit card online statement. I’d like to just pay it in full but what if I get accidentally overcharged? I checked my statement today and this exact situation happened. I got charged for 5 diaper covers instead of 4!!!! I had to email them and ask them for the difference. If I just cleared it in full and didn’t check each one, line by line, I’d have been out that $$$. SO the cashback thing hasn’t really happened or taken off in Australia, which is why I don’t use a credit card more. I don’t go line item like you do, but pay it off every pay and review what’s on there. There’s only ONE automated deduction (my $30 phone credit), but otherwise, everything is expected. Oh boo hiss. If that were the case I’d debit all the time. OR use cash.